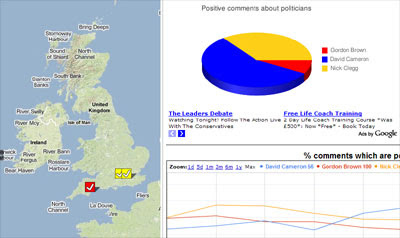 Electwits.co.uk is another Twitter and Google Maps application trying to track the real-time conversations around the upcoming UK general election. The application tracks the positive and negative comments made on Twitter about the leaders of the three main political parties in the UK. To post your support for a party leader simply tweet the politician's name, a happy smiley, your postcode and the tag #electwits. For example, "Nick Clegg is the boss :-) #electwits SW1"
If you Tweet your postcode your message will appear on the Google Map. The application also displays a number of graphs to show the number of positive comments made about each of the three candidates for Prime Minister.